Can you give some idea of the scale of your operation and your major challenges? We were founded in 2011 and we now have about two-thirds of all households in Reykjavik as customers. Slightly more than one-third of the country has an account with us for something. In Iceland we use our fleet of electric cars for the majority of our deliveries. The biggest problem we run into with drones is rain. We had the first licence to fly along one route in early August 2017 and we flew that route quite extensively until February/March last year when we applied for a new licence to extend the usability of that route. It was a route with low customer demand so we applied for a licence to cover the entire south of the city, along 13 different routes, and we got that licence in June 2018. Since then it has rained for eight out of 10 days; during the first 90 days it rained for 86 of them. So what we’ve done is put a heavy focus on solving the time and purpose of regulations. We look at this from a customer journey model. We want to reach a service level of 90% opening time, so that we’re open nine out of 10 days. We’ve invested in developing a rain-proof drone that is currently being assembled for us and should be delivered within a month. Is that another Flytrex drone? Yes, it’s based on the DJI Wind platform and once we have that we will have solved 90% of the issues that we have in the customer journey. We will be able to do a lot more than we are doing today. There’s a thick layer of snow over everything, so we are flying as much as we can, but we are limited too much by weather. We have 10 trained and licensed operators of the system who are also certified to fly drones up to 25kg manually in case of emergency. We fly along 13 routes and we can deviate it by up to 700 metres to make the actual delivery. The longest route we fly is probably about 4.2km each way, so a total of over 8km. That is just limited by the batteries we use in the drone so we can probably go to 5.2km to 5.5km if we use the larger battery sets, but we haven’t tried that yet and we haven’t had any reason to push that limit. With the new, rain-proof drone we believe that we can at least double that range. I think we could even go up to 24km in flight so that would give us a 12km distance from take-off point. We have the largest online marketplace platform in Iceland. The key difference between us companies such as Deliveroo is that their average delivery will be about 1km. It would never pay to have a drone fly 1km, it’s much better to send a bike to make that delivery. Our average delivery is 7km. It makes a huge difference for us if we can cut 6.5km off the delivery by flying a drone so we already have a business case that we can use today. Drone flights only become economical once they go beyond what sort of range? If you have a hamburger to deliver and you’ve got to load it onto a drone you have to monitor the take off and the landing. I don’t think the authorities are going to approve non-monitored take-offs and landings. The time it takes to cycle 500, 600, 700 metres is two minutes. So from my perspective it’s not economical to think of drone deliveries for a kilometre or less. What are some of the most interesting routes? We define the corridors based on the risk and the licence. We look at having a risk that is less than 10 to the power of -7. We are at -8 right now. We fly over residential areas when we need to, but we try to avoid it as much as possible. We try to aim for tree lines and we aim for the water as much as we can. In general the flight of the drone itself is the least risky part of the process because that’s where you have the least stress on the airframe. The risky part of the operation comes with take-off, landing and hovering issues. As soon as the drone will stop there is increased stress on the airframe, so at any waypoint you have a higher risk than during the actual flight so that’s where we are most focused on risk analysis. So you don’t land when you deliver – you stop the drone in flight and deliver the package by extending a line to the ground. Yes. For the first nine months we landed, and that’s when we immediately realised we would never reach any commercial viability when landing at the customer site. It’s way too risky and we’re going to have a very different procedure committed during commercial operation. How did you get the risk assessment agreed by the relevant authorities? When we started deliveries in 2014 we were delivering hot food and we quickly found that it was way too expensive. So we started looking into different options. We spoke to a few ground robotics companies but after the regulator, the Icelandic Transport Authority, told us it would be prepared to consider our robotic delivery plans the company we were talking to said they were getting traction in Germany, the USA and UK – reducing their interest in a small market like Iceland. We told the regulator we were going to be among the first countries in the world to do this or we were going to be the last because the market is so small. The regulatory told us it could not make an exception for us but it would prioritise our operation. That’s when we began talking to Flytrex. They told us they had stopped building their own delivery drone but were going to create a system that was platform agnostic and that as long as they could control the drone they didn’t care who made it. We really like their approach; it would be much easier to take a drone with hundreds of thousands of flight hours behind it and common spare parts and use that platform. Then it took us 14 months to get comments back from the authorities on our operational proposal. Since then we have reapplied four times because the first licence was just for one month. It was then extended and we had another licence for two months then for six months then they changed the regulations. Last spring we applied for the multiple route and delivery licence we have that now until May 2020. How do you track the drones? By GPS and mobile phone. We have three encrypted ways to communicate with the drone. There are three flight systems onboard. So once we take off, we pretty much have set out what the flight is going to look like and we haven’t had any issues that have required us to take over control other than minor corrections to landing. What’s been the public response to your operation? Everybody is pessimistic until they see it. I am a strong advocate that seeing is believing. Once people have seen it they completely change their mind. We have had only had two negative complaints, one about the landing space taking up parking spaces outside the office and the other was a near car-crash when the driver became distracted by the drone landing nearby. This is a real issue. How many flights have you done since you started? We’ve done about 700 delivery flights, but many more when you count the test flights. The maximum number of flights per day is around 30 flights by one drone. If you look ahead two or three years how much bigger will your drone delivery network be? I don’t think packages will be single-handedly delivered by drone. There will still be cars, bikes, trucks and lorries and other methods, including ground-delivery robots. We could see drone deliveries accounting for 50% of all our deliveries sometime in the future. But we are aiming to get to a place where we can fly 90% of the time, even with two or three hours or bad weather a day. And we have weather which is ten times more severe than in the UK, for example. 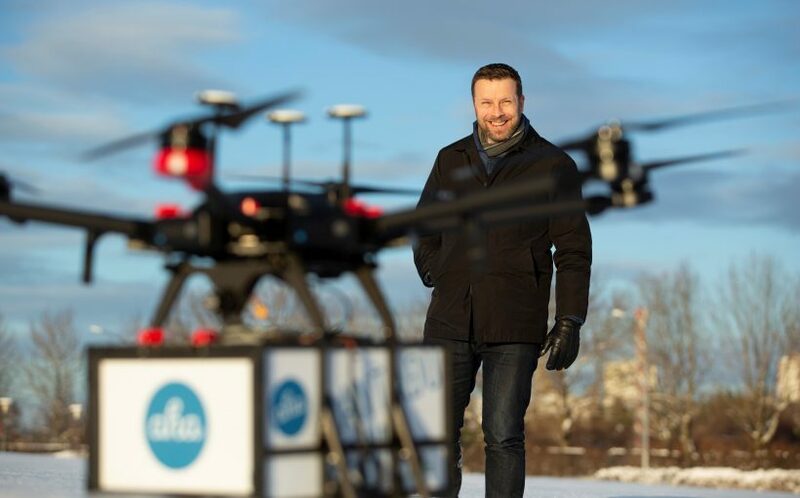 We want to be able to offer shopping centres internationally the ability to set up a marketplace and drone delivery service for them where they can use drones for 50% of the time and for the rest of the time we will set up a fleet of cars for them. Drones are just a part of the concept but they are going to be an increasingly important part of that in the future. At what stage in your operations will you need to have a comprehensive UTM system? We already have a UTM system but it only encompasses the drones we control and is unique to the Flytrex platform. You don’t need many more operators before you start feeling uncomfortable. Although the risk of two drones colliding is very low it’s still uncomfortable flying with another operator in the air using autonomous drones. Right now we are alone and that’s a benefit. And we are in close contact with the airport control tower and know the plans for manned aviation for that day. And they know to put a big circle around wherever we’re operating. But of course we need a UTM system in the future and we’re all for working together with various parties, authorities and others to get this in place. You are not worried about the sudden appearance of emergency helicopters? No. Emergency helicopters mostly go via fixed routes to the countryside and fly along normal flight paths so we do not come across search and rescue operations inside the city. But let’s say we are flying and there was a search and rescue operation going on – it happens once in a while. Immediately the control tower calls us and tells us to ground all the drones. This happens once every two years in Reykjavik. How involved has the local authority been in your operation? We had to get approval from them. We had to be approved by the civil aviation authority, ISAVIA, the airport operator, the transport ministry, the police of Reykjavik and Reykjavik City. The City had the power to say “no” but they did say we could not fly above a particular public path in the middle of the city or other sensitive areas. But all communications with the authorities have been really good. Now we are looking to extend the routes to southern cities of Reykjavik and a few others, and they’re all very positive. We have good roads but now we have so many tourists on the roads that we have traffic congestion like you cannot imagine. But for each electric car that we have on the road, we have taken four family cars off it and each drone can do the work of three to four electric cars. So you start to see the multiplication of benefits. If you look at this from the social and economic benefits of society, it’s a huge, huge benefit from all perspectives. You will need fewer roads and less infrastructure. And, in our view, you have a much safer way of delivery packages than driving on the roads. Drones will be capable of doing 100 errands a day once they are up to speed and everything is running. The big thing that’s happening now is that we’ve started doing backyard deliveries which makes a huge difference and those customers who have their backyards approved are ordering many, many more times than others. The key thing here is that it takes two to three months to approve a backyard delivery. Because you have to have a delivery point and draw a 50-metre radius around it and contact every building, inhabitant and so on and get their approval. As we know, neighbour relationships can be tricky…so we are applying now for an exemption from the 50-metre rule based on what has been done in Australia and we are hoping to get that exemption. We have quite a few backyards approved so far in addition to about 20 public delivery points.